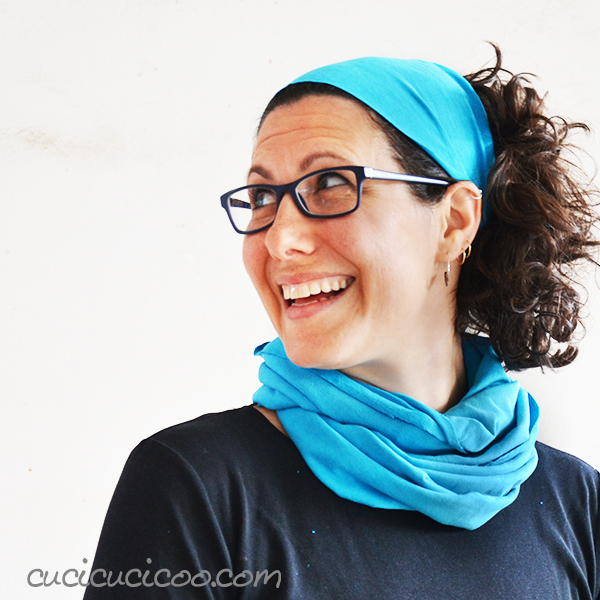 Home Tutorials (all) Accessory Tutorials How to make a 30 second infinity scarf and headband! 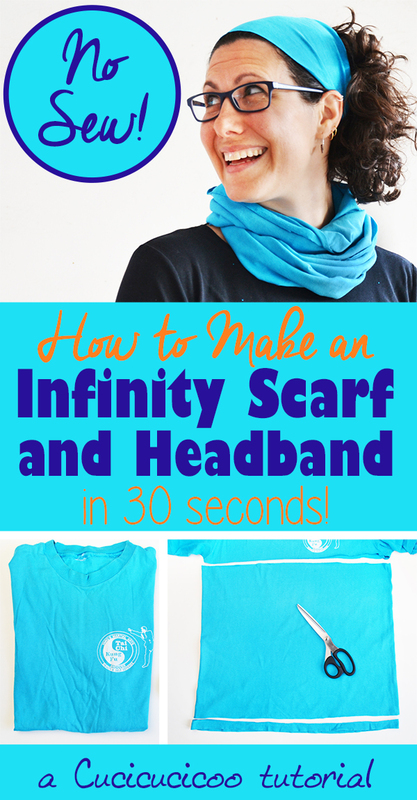 How to make a 30 second infinity scarf and headband! I am a total infinity scarf junkie. I am also a junkie of upcycling old T-shirts. And, even if I know perfectly well how to sew, I also love super quick projects that require no sewing. 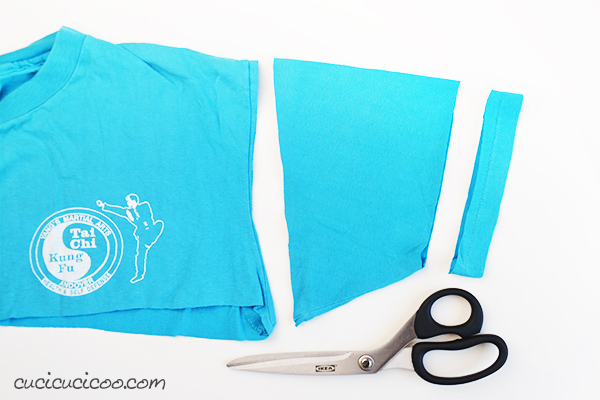 Last year I published a great tutorial on making infinity scarves from T-shirts by sewing together strips of the cut shirts. But sometimes it’s nice to just keep things simple. Which is why today I’m sharing a way to create a matching infinity scarf and headband set in little more than a blink of the eye. Without sewing! That’s right! 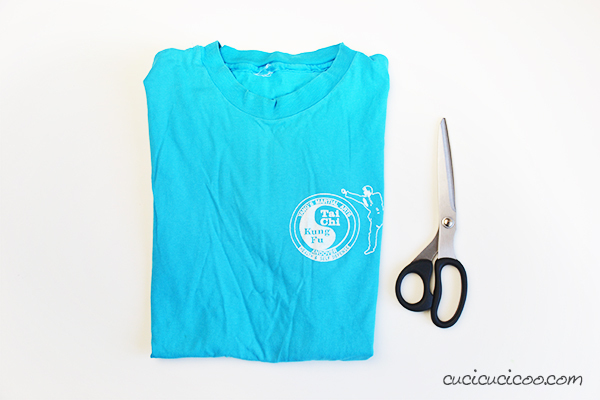 All you need for this project is a T-shirt and a pair of scissors! Are you ready? 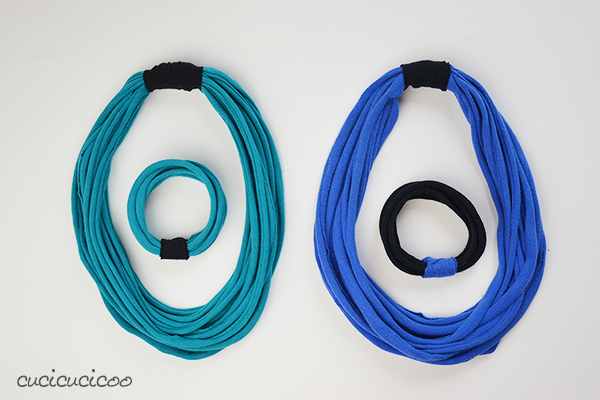 Let’s make a 30 second infinity scarf and headband set! 1. 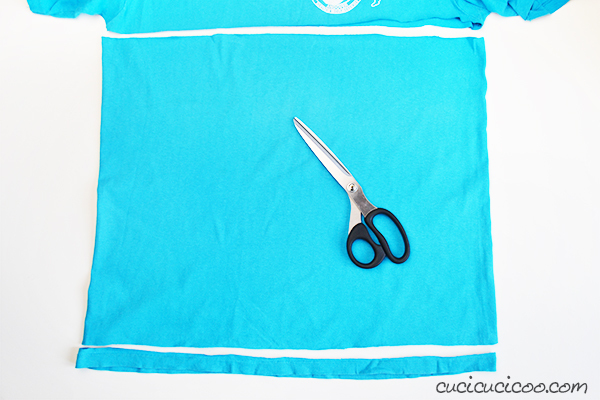 Lay the T-shirt out flat on a table, smoothing out any big wrinkles. As you can see, I didn’t even bother to iron the shirt because it’s just going to get crumpled up anyway. 2. Cut off the hem. 3. Cut across the shirt, under the armpits. Now just wrap it around your neck a couple of times and you’re DONE! I bet that took you 15 seconds max. So let’s take another 15 seconds to make a matching headband. 1. Smooth out one of the shirt’s sleeves so that the seam is at the bottom. 3. Cut across the sleeve, just beyond the shoulder seam. Slip if over your head and you’re DONE! And there we have it: perfect accessory set for the spring! Actually, this type of headband is absolutely perfect for bad hair days any time of the year. I’ve been using them a lot since I started styling my hair curly, because I’m discovering that bad hair days are much more frequent with this type of hair than my previous super short pixie haircut! I’m willing to bet that you have one or two old T-shirts hanging around and you can probably find a minute to spare in your busy schedule, so go grab your scissors and make one or two of your own fun 30 second infinity scarf and headband sets! If you love repurposing T-shirts, but don’t know how to sew, make sure you check out these super easy T-shirt bracelet and necklace sets! Just like this tutorial, all you need to do is cut! Refashioning has never been easier! Previous articleThe easy way to hem a circle skirt in 15 min. with bias tape! Next articleHow to print on Heat N Bond for fast and easy appliqué! 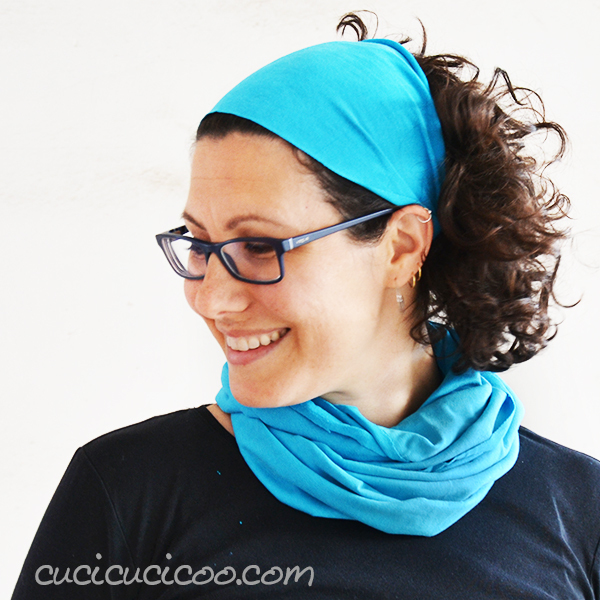 Oh, I need a headband for bad hair days – super simple solution, Lisa. Sometimes easy and no sew is the way to go. Especially when it’s as quick as can be! Thanks for stopping by, Pam! Wow, le fasce per capelli da jeans saranno bellissime! Ovviamente ci metterai l’elastico, vero? Vorrei tanto vederle quando le fai! What a great idea! Thank you for sharing this with us at Funtastic Friday link party. Thanks, Joyce, and thanks for stopping by!